TORONTO (Scrap Monster): The Canadian Plastics Industry Association (CPIA) congratulates the City of Toronto on the expansion of its Blue Box program to accept a wider range of recyclable soft plastics. As of June 1, 2015, the types of plastic film accepted in the Toronto program extend well beyond the plastic grocery bags it has managed for many years to include a wide range of flexible plastic packaging items, such as bulk food bags, dry cleaning bags, newspaper bags, produce bags, frozen fruit and vegetable bags, and film over-wrap from toilet paper, paper towel, bottled water and soft drink packaging. 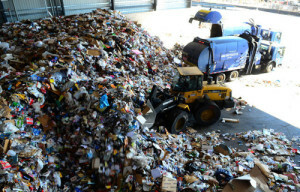 This positive move is expected to increase the volume of recyclable material diverted from landfill by an estimated 3.5 million kilograms per year. “The mandate of CPIA’s post use resource recovery program is to support and encourage the collection and recycling of all types of recyclable plastic, including films, in an effective and efficient manner. Toronto’s decision to expand its Blue Box program will have a positive impact on the overall access to recycling of plastics and the volume of materials diverted from landfill and available as recycled content,” said Krista Friesen, Vice President of Sustainability of CPIA. Looking back, in a 2012 CPIA report, The City of Langley ‘Blue + 2’ Pilot, the CPIA and partner organizations were successful in demonstrating that curbside collection systems can incorporate plastic film at virtually no additional cost to collect and deliver it to Material Recovery Facilities (MRFs). To capitalize on this collection system, MRFs also require investment in new technology and sorting infrastructure to effectively manage and grow the range and volumes of materials. “We are very pleased that the City of Toronto has bridged the MRF technology and processing gap and decided to collect and process this wide range of recyclable plastic film in its Blue Box program,” said Carol Hochu, President and CEO of CPIA. In addition to the work the CPIA does to support municipal recycling programs across Canada, the association is also working with the private sector to increase the types and volumes of flexible plastic packaging being diverted from landfill. In 2014, CPIA worked with a GTA-based mall management firm to develop a system to capture post-commercial plastic film from stores that receive large volumes of product in recyclable plastic film. The pilot project is now finished and a case study is being developed to assist other retailers and property management firms in expanding their recycling programs to include plastic film. Additionally, CPIA is working in partnership with a national retailer to design a program that will capture a wide range of post-consumer film for recycling through a return-to-retail model. If this retail-based project is successful, it will result in a very convenient collection channel for many Canadian consumers in both rural and urban jurisdictions.